All-In-One - Generate PDF Invoice, Packing Slip, Labels & Delivery Note. Packing list provides essential information to the customer and others involved in the transaction, subject to shipping. A packing list can be used as a supporting document in case of any conflict between conveyor and exporter regarding the cargo. It is also used by Customs for clearance and entry into foreign countries. To file a claim with the shipping or insurance company in the event of cargo damage or loss, a packing list can be given as a validation document. Including a packing list along with an invoice when you are shipping a package, is best practice, which establishes an extra line of communication between you and the customer. WebToffee provides this functionality with it’s Print Invoice, Packing Slip, Delivery Note & Label Plugin for WooCommerce. All the documents that are integral to shipping (like PDF invoices, packing slips, delivery notes, and shipping/address labels)will be automatically generated with this WooCommerce extension. Once you have installed and activated this plugin, a new section is available in the WordPress menu titled Invoice/Pack List. Packing Slip/List is a document containing an itemized list of products, without providing the price information. You can get to this section by navigating to Invoice/Pack List menu from your WordPress dashboard. When you click on the Packing Slip tab, you will be taken to Packing Slip settings. 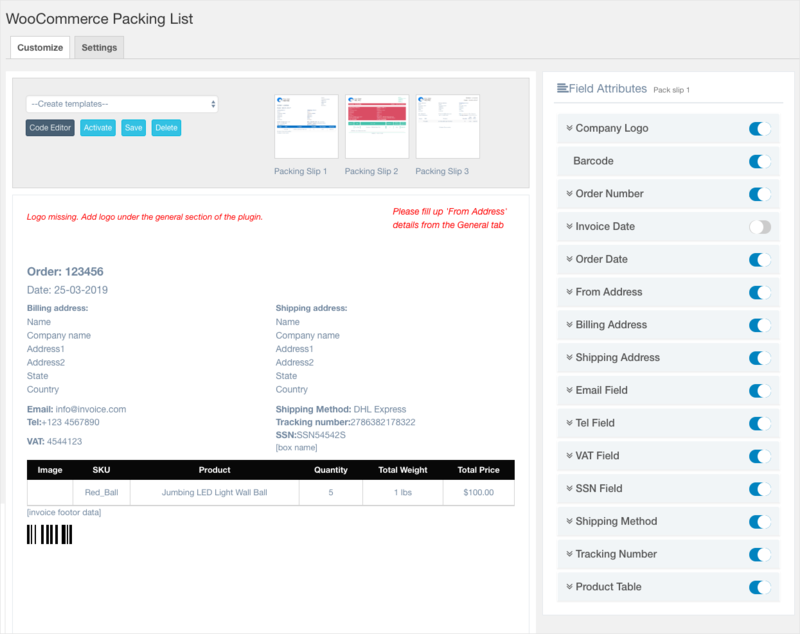 This section helps to configure customizing packing slip templates, inserting product image & price, and adding additional fields (in the packing slips). Enable Packing Slip by selecting the checkbox. Select a template or customize a template taken from the given options. Include product image, price, and barcode information on the packing slip. Remove total weight column from the product table of the packing slip. Add additional fields in the packing slips and meta fields related to the products in the packing slip product table. Set a custom footer to be printed in the packing slips. For detailed information, you can refer the Product Page. This entry was posted in Documentation, Getting Started, Print Invoice, Packing Slip, Delivery Note & Label for WooCommerce. Bookmark the permalink. You can add custom fields or metadata stored with order details on the packing list via the Additional Fields	> Add Existing Order Meta. You can use the database key in which the data is stored as meta key and enter a field name of your choice that will be displayed. Reach us via support link above for further queries. We will be publishing an article soon documenting these separately.